The reason why is a funny little story. I grabbed a few computer magazines from the 1980s off of my shelf the other day and sat down to flip through them, as one does. Shortly after opening the January 1986 issue of Macworld (volume 3, number 1) I noticed it was missing a page. Page 13 had been torn out, fairly cleanly. I pondered this for a moment and then the memory came back to me. In January of 1986 I owned an Amiga 1000 and had since the first units appeared in the local computer store in October 1985, shortly after the Amiga launch. I had been wanting and waiting (to sell an Apple //c) for a Macintosh during the summer of 1985. And, I got one…but returned it after a week or so because of encountering the Amiga in person at the aforementioned store. I was still receiving my Macworld subscription, though. 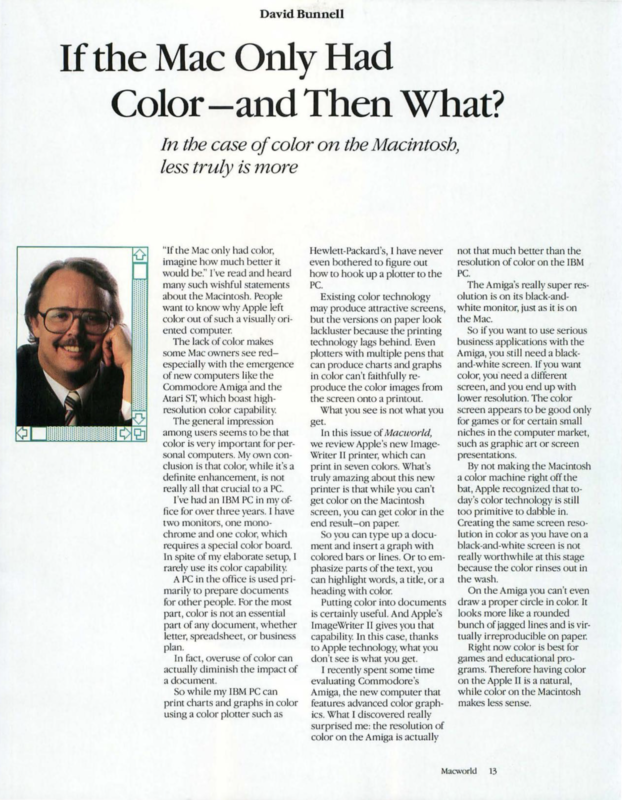 On page 13 of the January 1986 issue, in the publisher’s column, David Bunnell ran a piece entitled “If the Mac Only Had Color–and Then What?” The piece spoke of the frustration some Mac owners were feeling, seeing GUI-based machines sporting color displays such as the Amiga and Atari ST hitting the market. (The Macintosh II, offering a color display, did not appear until the following year.) Bunnell tried to allay such reader envy, pointing out that his three-year-old office PC had two monitors, one color and one black and white, and that he almost never used the color display. He went on to speak in high terms of Apple’s new ImageWriter II printer, reviewed within the issue, capable of printing seven colors, even on the Macintosh. Bunnell then headed in a direction that raised my 13-year-old ire. He indicated he had recently spent time evaluating the Amiga and — well, I’ll let him speak for himself. I recently spent some time evaluating Commodore’s Amiga, the new computer that features advanced color graphics. What I discovered really surprised me: the resolution of color on the Amiga is actually not that much better than the resolution of color on the IBM PC. The Amiga’s really super resolution is on its black-and-white monitor, just as it is on the Mac. So if you want to use serious business applications with the Amiga, you still need a black-and-white screen. If you want color, you need a different screen, and you end up with lower resolution. The color screen appears to be good only for games or for certain small niches in the computer market, such as graphic art or screen presentations. 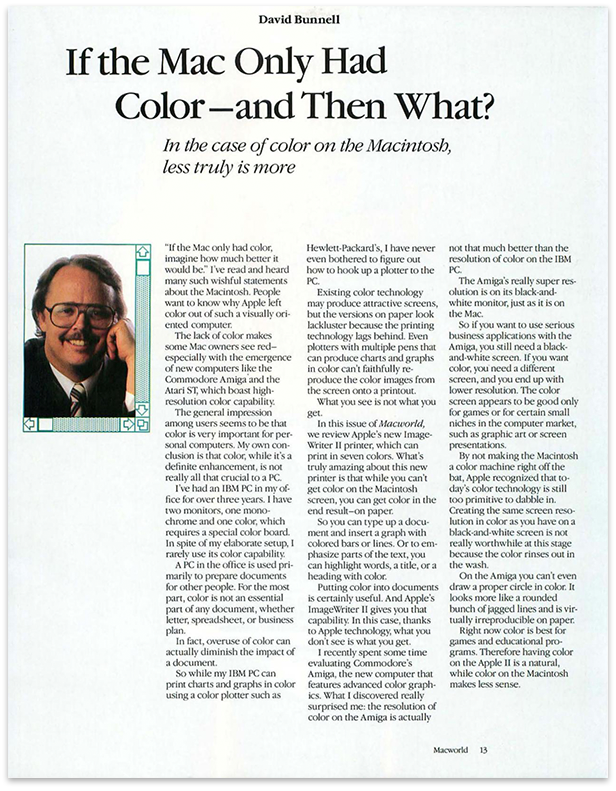 By not making the Macintosh a color machine right off the bat, Apple recognized that today’s color technology is still too primitive to dabble in. Creating the same screen resolution in color as you have on a black-and-white screen is not really worthwhile at this stage because the color rinses out in the wash.
On the Amiga you can’t even draw a proper circle in color. It looks more like a rounded bunch of jagged lines and is virtrually irreproducible on paper. Right now color is best for games and educational programs. Therefor having color on the Apple II is a natural, while color on the Macintosh makes less sense. As a (13-year-old) Amiga user, that really pissed me off. Commodore did not launch the Amiga with or promote any monochrome display. The Amiga’s high-resolution screenmode was 640×400 pixels (plus overscan) in 16 colors out of a 4096-color palette (while the Mac’s was 512×342 pixels, black and white). In order to work with less expensive 15kHz screens, this mode was interlaced (like television), and so GUI-type on-screen images exhibited flicker. I have heard that Commodore planned to release a long-persistence (slow-phosphor) RGB monitor to reduce flicker, but I don’t believe that ever made it to production. I spent hours and hours using Deluxe Paint to create video art in the interlaced mode. And the circles were smooth. I had recently received an Okimate 20 high-resolution color printer for Christmas and my bedroom wall was covered with full-color printouts of my “paintings.” I was in such a lather after reading Bunnell’s article slighting the Amiga that I sat down and typed out a letter — to Commodore — making them aware of the shots fired, complete with a few (smooth) circles drawn in color at the bottom. I printed it out on that printer, evidence of the Amiga’s ability to reproduce color circles on paper, and mailed it off to West Chester, PA along with page 13. I have no recollection as to whether or not I expected some kind of response. (I received none). I suppose it was mainly catharsis. Since my copy of this Macworld is missing page 13, I had to consult the Internet Archive to capture the page in question. This entry was posted in Amiga, Just Rambling, Macintosh. Bookmark the permalink. Did you send the article to Commodore with your letter? Or did you rip it out and throw it away in rage? So, I had an A500, and one of its unsung features was a monochrome output via rca jack. I hooked our old apple III monitor up to it, and I have to admit- it looked amazing. 640 x 480 with 16 shades of green was better than Just about anything out there at the time. Falcon in particular looked so sharp- way better than Mac or pc at the time. It also made Mac emulaton easy. It really was pretty cool to be able to do that along with the great color output. Earl weaver baseball in 640 x 200 at 16 colors was very sharp as well. I would say that it’s not that good as the green phosphor is far slower than rhe red and blue and it doesen’t help that much against the interlace flicker. So the 2088 exists! Any photos you can offer? Video? Thanks! I wonder if David Bunnell was dismayed by the introduction of the Macintosh II little more than a year later? I guess he also didn’t see desktop publishing or digital pre-press coming either. It is as much a blunder as Bill Gates’ “640K ought to be enough for anybody” (even though there appears to be some debate over whether Gates actually said it). There was all kinds of mis-information and playing down of the Amiga’s features in the early days of the computer. The one I heard the most was, “nobody needs multitasking?”. My answer was always, “I do!”. It was especially a big deal if you used BBSs, did any 3D rendering, or lots of printing, it absolutely _did_ make a huge difference. Like a lot of the Amiga’s other features, it a standard thing now, so 30+ years later. But yeah..for most Amiga users 16 COLOR HiRes mode was actually quite useful. Especially later when the flicker fixers started to come out. Absolutely. It was a perfect BBSing machine. You could have music going, jump over and view images and animations you downloaded while still online – seamlessly. I sold my Amiga 1200 and got a Mac LC and then a 486 PC (DOS) and you were stuck just doing BBSing. By the time Win95 landed, I had moved off of BBS’s onto PPP Internet, so could do those things, but the Amiga made it work a decade earlier. Kind of amazing.